Low Impact Development (LID) is a promising approach to stormwater management that focuses on creating sustainable hydrological conditions that amend the impacts of urbanization and land development. The purpose of LID is to understand natural environments and translate that knowledge into practical applications within the field of stormwater management. The key elements that shape the behaviour of water when it makes the transition from atmosphere to land are soil and vegetation. 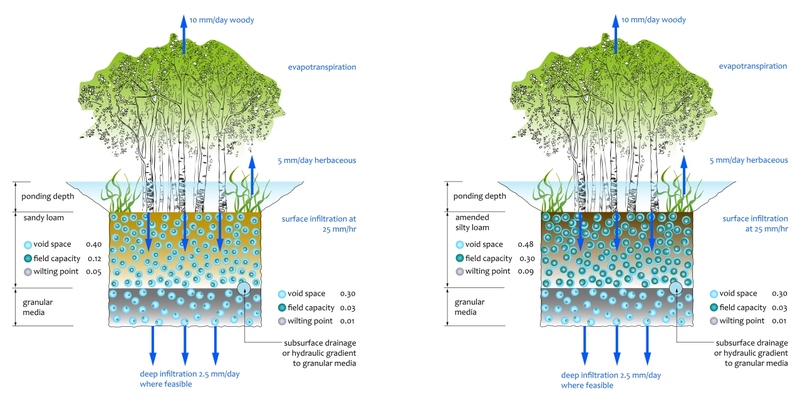 To date, LID has approached the issue of managing stormwater by modifying the soil parameters in an attempt to shape the hydrological functionality of a particular system. The focus of soil analysis is primarily on maximizing infiltration and minimizing leaching. The soil mix that meets the criteria is dominated by chemically and biologically inert coarsely textured particles, such as sand. There are cost and long-term functionality issues that are associated with using sandy mixes, as sand needs to be imported into areas that are dominated by clay soils, and hydraulic conductivity of sand gets reduced over time as the pore spaces fill up with sediment. An alternative approach is one that focuses on LID features as systems where living organisms play a vital role in hydrological functionality. The living organisms that are of greatest functional relevance to stormwater management are plants and soil microorganisms. These organisms play a crucial role in soil formation and hydrology. These organisms possess the biochemical capacity to breakdown various contaminants that could be present in stormwater. These organisms also require water, nutrients, and essential elements to function. Sandy mixes provide limited support for biological activity, which puts sand-based LID systems at risk of failure. Source2Source Inc. approaches LID system design by identifying conditions that benefit the living organisms the most, and ensure their successful proliferation. The soil medium is not approached as a collection of individual particles that allow water to move between them, but as a system that goes through change and provides resources for plants and microorganisms. Soils characterized by finer particles, such as silt and loam, offer greater relative stores of water and nutrients than sandy soils do. 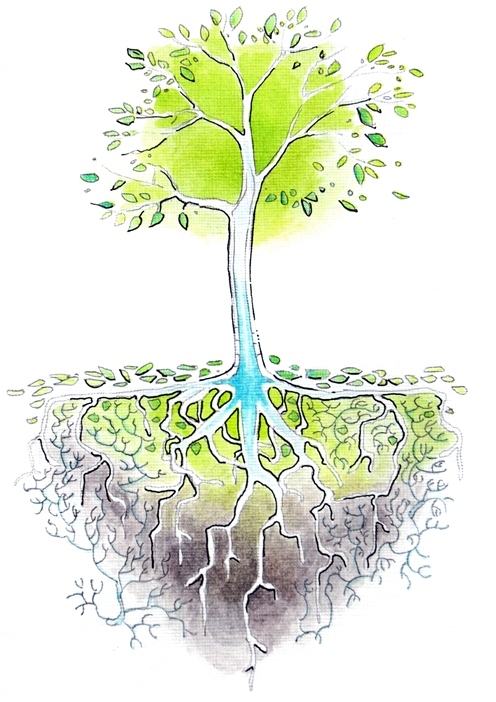 Water that enters any soil by infiltration is restricted in its movement to the soil pore space and is subject to gravitational and inter-molecular forces. The gravitational force is not related to the type of soil, and will always induce downward water movement. The inter-molecular forces vary among different soil types. Loam has a greater degree of inter-molecular interactions than sand does due to the differences in the nature of their particles. The inter-molecular interactions between water and soil particles are responsible for retaining water in the surface soil horizons, where it can be available for plants and microorganisms. The fraction of soil water that can be retained by a particular soil type following saturation and gravity drainage is referred to as field capacity. The field capacity of loam can be up to 3 times greater than the field capacity of sand. The diagram below represents a general comparison of soil water parameters of sand and loam soils in a typical LID setting, and the differences in the relative proportions of water that can be stored within the bulk of LID media and water that can be returned to the atmosphere via evapotranspiration. It is common to characterize loam and silt soils as having reduced infiltration capacity as compared to sand. However, such characterizations are based on conditions where soils are analyzed independently of the effect that living organisms have on soil structure and function. The 25 mm/hr infiltration rate is the standard hydrology textbook value for sand infiltration, yet the value for loam is usually much lower. The value of amended silty loam inifltration rate presented here as 25 mm/hr stems from a permeability analysis done on a bioswale project designed by Source2Source Inc., Kennedale Bioswale. The increased infiltration rate is attributed to the growth and proliferation of plants, specifically their roots and associated biota within the Kennedale Bioswale media that was dominated by silty loam, which showed to be highly suitable for the living organisms. Plants have been shown to be capable of increasing soil hydraulic conductivity over time periods that can be as short as several years. 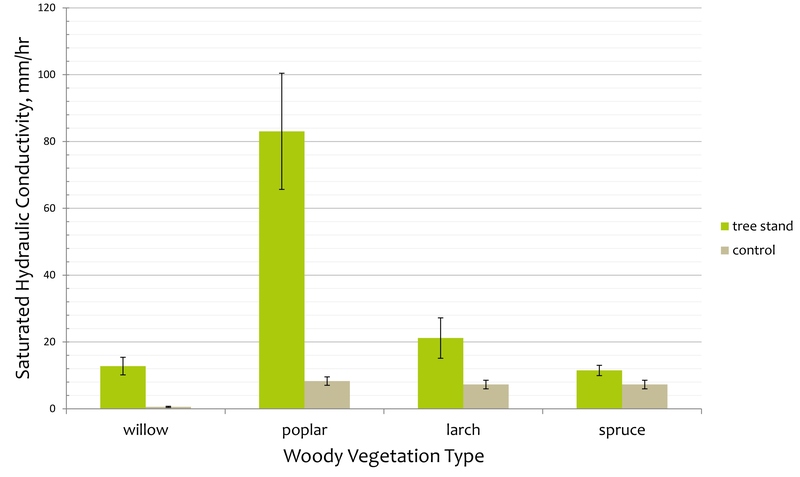 Analyzing hydraulic conductivity of established plant stands can provide insight into the changes in soil hydraulic functionality associated with vegetation impacts. Anton Skorobogatov has conducted a research project analyzing the difference in effects that specific plants have on soil hydraulic conductivity, and the data suggests that certain woody species are capable of inducing an increase in the soil hydraulic conductivity of up to 10 times. An example of highly successful use of stormwater runoff and fertile soils can be seen at Prairie Sky Condominiums, designed by Bernie Amell. The growth and health of the plant species that are part of the stormwater management system of the condominium units are dramatic. 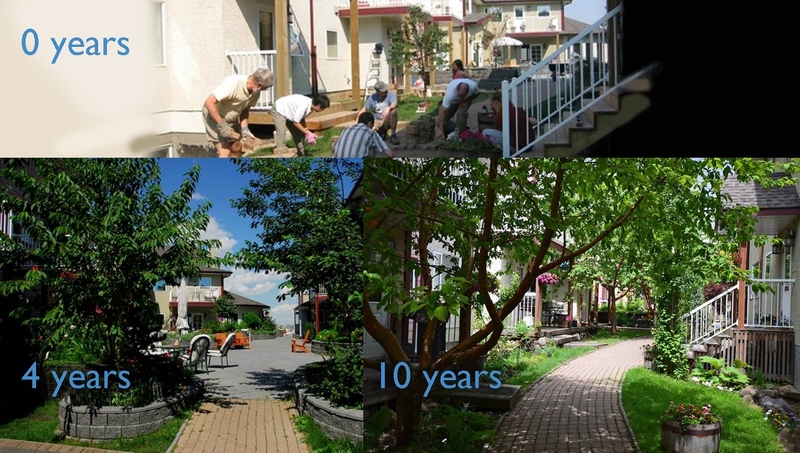 This emphasizes that in a water-limited climate, such as Calgary, runoff volumes can be effectively reduced or eliminated by using vegetated absorptive soil beds that are designed to support living systems.